NEW DELHI — The Indian Navy is unlikely to meet its long-term plan of infusing modern technologies due to a resource crunch and delays in project execution, according to a Navy official and defense analysts here. "Indian Navy's 15-year plan will require a funding support of around $123 billion," an Indian Navy official said. "This means an annual capital allocation around $8.5 billion as against this year['s] allocation of only $3 billion, 95 percent of which is already committed (for past contracts), leaving only $153 million for new programs. "So there is no way that the Indian Navy can meet the challenges." The concern comes at a time when China is increasing its deployment of warships, submarines and an aircraft carrier in the Indian Ocean region. "Problems of India's national/maritime security are of such magnitude that they require deep application of mind and undivided attention of [defense] political leadership so that the long-term solutions are evolved instead of 'Band-Aid' fixes," said Arun Prakash, a retired Indian Navy admiral. "The Indian Navy is building its capacity to be the net-centric security provider in the Indian Ocean, but presently there are some capability deficits (I don't call them gaps) in certain key areas, which need to be addressed urgently," says Anil Jai Singh, retired Indian Navy Commodore and defense analyst. Last year, the Navy introduced the "Indian Naval Indigenisation Plan (INIP) 2015-2030," which specified the need for locally developed, advanced systems for its platforms. The service's plan is consistent with the Ministry of Defence's report, titled "Technology Perspective and Capability Roadmap (TPCR)," from April 2103 that calls for the acquisition of modern subsonic, supersonic and ballistic missiles; equipment and sensors; propulsion and power generation; and surveillance and detection systems. The MoD report advocates a shift from an ammunition-based, theater-centric model to a model that's network-centric and based on directed-energy weapons. However, despite the Indian government's resolve to acquire assets mostly through the domestic route, the Navy has been unsuccessful in constructing an efficient maritime-industrial complex. The Navy's long-term plan spells out the need for 198 warships by 2027, out of which 120 warships should be "capital warships," which would include large, offensive combat platforms like aircraft carriers, destroyers, frigates, corvettes and submarines. Against this requirement, the Indian Navy has just 140 vessels today, of which barely half are capital warships. "Our Achilles' heel is our lethargic military-industrial complex, managed by bureaucrats and scientists with no accountability. Unless we can produce machinery, weapons, sensors and ammunition indigenously, our Navy cannot sustain blue-water maritime operations for any length of time. This will not happen overnight — and we have not even made a start yet. It is not related to funding, but to envisioning and planning," Prakash asserted. The Navy is also struggling to infuse new technologies like precision-guided ammunition and network systems. But aviation is the foremost problem for the service. "There is huge deficiency of multi-role helicopters worth $3 billion, naval utility helicopters worth $2 billion and amphibious aircraft," according to Sujeet Samaddar, a defense analyst and retired Indian Navy commodore. However, Singh is hopeful that the situation can be salvaged. 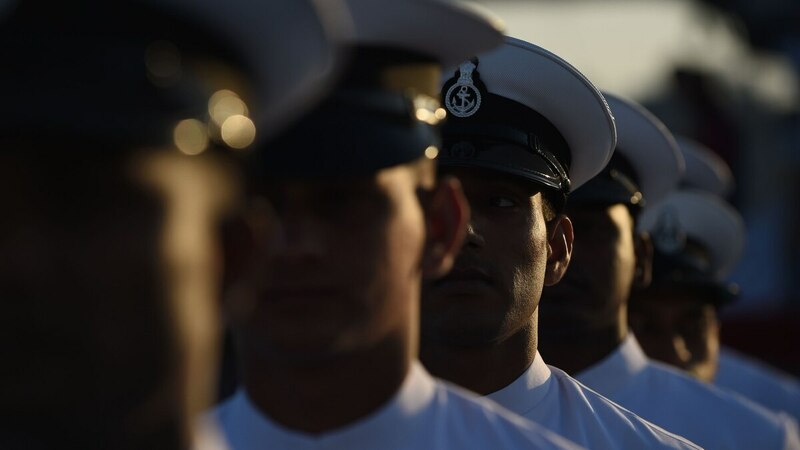 "Judicious prioritization by the Navy with adequate support and accountability of the MoD's civilian bureaucracy can salvage the situation to some extent in the short term and get it back on track in the medium and long term."